From Friday night to Sunday night, nearly every week, when most metalforming facilities sit quietly idle, some 50,000 pounds of sheetmetal undergo processing at Laystrom Manufacturing. During one recent weekend, the Chicago firm processed 73,000 lb. of material lights-out, requiring only a short Saturday visit from an operator to restock its raw-materials storage tower. 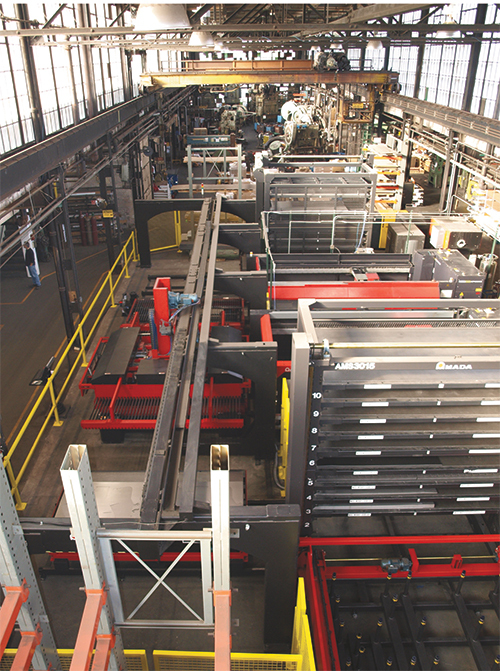 Two 10-shelf storage towers flank a pair of 4000-W laser-cutting machines to comprise Laystrom Manufacturing’s 3800-sq.-ft. laser-production cell. Cell activity starts at the raw-material storage tower (top) and ends at the finished-goods tower (bottom), where fork-truck drivers remove cut sheets and direct material for further processing—primarily press-brake bending. Watch it run by visiting our online Multimedia Center at metalformingmagazine.com. 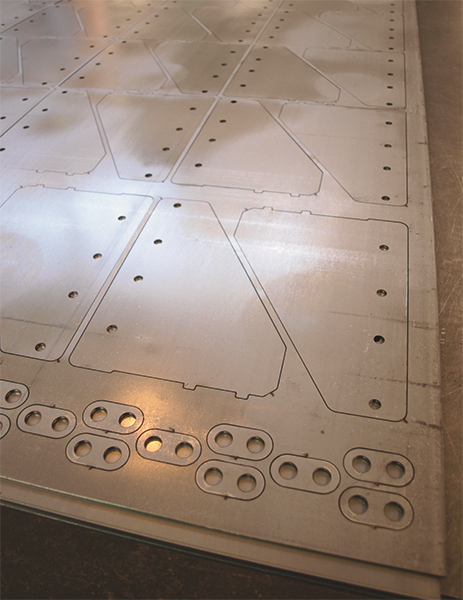 Enabling such unattended productivity is the firm’s main attraction, an automated laser-cutting cell. The cell stars two 4000-W cutting machines flanked by a 10-shelf raw-material storage tower at one end and a 10-shelf finished-goods storage tower at the opposite end. So while Laystrom has its roots firmly planted in hard-tooled metal stamping, and still provides stamped metal parts to a variety of customers, it’s the company’s investment in flexible fabrication equipment that’s enabled the successful transformation into the world of mass customization, according to president Bob Laystrom. The business churns furiously at Laystrom, where dozens of new part numbers enter production every month. That’s a far cry from its stamping days, and requires a different mindset, all the from the management suite to the production floor. Contributing mightily to that mindset shift was the firm’s acquisition, in 2006, of a local (Elk Grove Village, IL) sheetmetal fabricator. 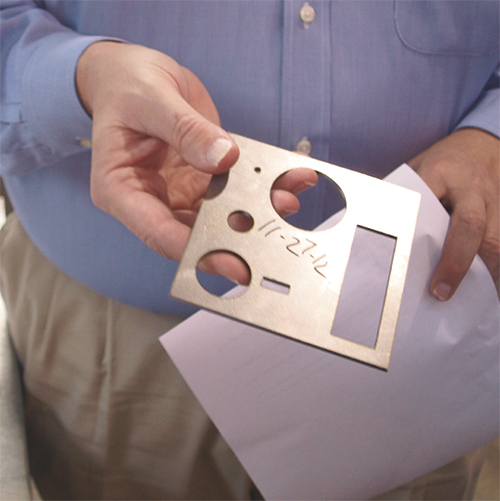 The human capital and expertise the company gained in that acquisition enabled Laystrom’s transformation from low-mix high-volume stamping to high-mix low-volume fabrication. “The acquisition proved vital for us,” says Laystrom, “not so much for the capital equipment we acquired but rather for the talent that came to us.” Of the firm’s 60 employees, 10 came from the fab shop Laystrom acquired. Laystrom is piloting a process to shift from product validation to process validation, by creating standard coupons (shown) of varying combinations of workpiece material types and thicknesses, and laser-cutting the coupons to develop acceptable cut quality. It then documents the process parameters so that when starting a new job, the machine operator will simply compare the part to the coupon, verify proper process settings—optics, cutting parameters and so on. Laystrom added to his automated laser cell in 2011 with the purchase of a second 4-kW machine, this one an Amada FOM2 machine with high-speed shuttle table. The FOM2, says Amada, boasts new features such as an eight-station automatic nozzle changer, water-assisted cutting and cut-process monitoring for automatic pierce detection—designed to minimize pierce time, particularly useful on thicker plate. This feature senses the instant that the laser beam pierces the material, and then immediately initiates the cutting process. The firm’s newest laser-cutting machine also features a downdraft dust- and fume extraction system (from Camfil Farr) located beneath the cutting table. It’s divided into four sections, and during the cutting process, only the ducts directly beneath the cutting head are open for fume extraction. The ducts in the other sections remain closed to improve dust collection and reduce energy consumption. Amada also says that the machine’s state-of-the-art resonator and optics system increases cutting speed and quality over previous models, which Laystrom can attest to. Most (70 percent) of the material that runs through Laystrom’s laser-production cell, and moves onto a series of press brakes for forming, comprises carbon steel. And some 30 percent of that work winds up in assemblies for the firm’s largest customer, an OEM manufacturer of agricultural machinery. Stainless-steel sheet represents another 15 percent of the work load, much of it for the power-distribution industry. Laystrom’s fabrication department processes material from 0.030 to ¼ in. thick, with plenty falling within 0.030 in. to 14 gauge. Sheet size has grown as the firm has replaced its original 1998-vintage laser (48 by 48 in. sheet capacity) to a maximum of 60 by 120 in. In addition to supplying the agricultural market, Laystrom has a sizable customer base for precision stamped and fabricated parts in the medical and telecommunications industries—each comprises 20 percent of its workload. Lastly, cut-edge quality took a turn for the better when, in 2008, the firm committed to using nitrogen assist gas, rather than oxygen, on any work thicker than 11 gauge. “Nitrogen cuts faster and improves edge quality to help avoid deburring and improve paint adhesion,” says laser technician Hugo Vega. “We’ve been taking on more stainless-steel work and heavier-gauge mild steel,” adds manufacturing manager Eric Hauser. Laystrom’s fabrication department processes material from 0.030 to ¼ in. thick, with plenty falling within 0.030 in. to 14 gauge. With its newest laser-cutting machine, purchased in 2011, it’s experienced a 5- to 7-percent increase in effective speed, or output and productivity, compared to its 2008-vintage laser-cutting machine. “Most of that improvement comes from increased control over the piercing process,” Laystrom says. To support its nitrogen habit, Laystrom purchased two Amada EZ Cut nitrogen-generating systems. Compared to using bottled nitrogen, according to Amada, using generated nitrogen (95 percent pure) will provide a more polished finish on thin-gauge stainless steel. Watching the automated laser-production cell run is like watching a carefully directed symphony. Each cell component relies on the other components, and the entire orchestra of parts relies on the conductor—the operator (and also the programmer) to carefully direct its activities. Featured is the Amada AMS 3015 system; Amada says that more than half of its customers that have purchased the system have added a second laser, as has Laystrom. The modular building-block system includes the raw-material and finished-sheet storage towers, and shuttle tables for carrying material to and from each laser-cutting machine. Each tower shelf is rated to 4400 lb. of material and a maximum stacking height of just under 5 in. “And, down the road we can increase capacity by adding another five shelves to the material tower,” says Bob Laystrom. Most often, the workcell processes a fully loaded tower of raw material over two shifts. The operator will start his day by spending 2 hr. loading the material-storage shelves to capacity, and initiating the programmed run cycle from the cell scheduling controller. “We probably run 50 different types and thicknesses of carbon steel, stainless steel and aluminum regularly,” adds Vega. The software (Amada’s Dr. Abe) then takes over. It tracks inbound material inventory, and also keeps tabs on where each job ends up in the finished-goods tower. “And we can monitor the entire cell over the Internet via computer or smart phone,” adds Foley.